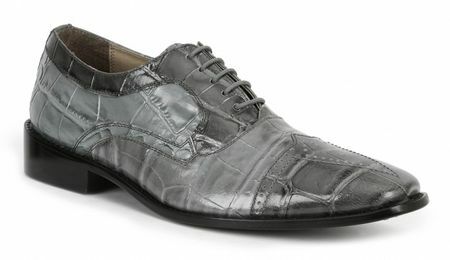 You can have your cake and eat it too with dress shoes by Giorgio Brutini like these gray alligator texture cap toe dress shoes made of both alligator print leather and lizard print leather with a sleek looking sole. Giorgio Brutini specializes in mens fashion dress shoes for the man who favors wearing a matching Homburg Hat on his head and made only of leather and have their style designed in Italy. These shoes come in a medium width only.